Mass protests in Algeria have forced 82-year-old dictator Abdelaziz Bouteflika to resign after 20 years in power. Since 22 February, protesters have taken to the streets every Friday to demand he not seek re-election for a fifth term. Millions of protestors took to the streets again for the seventh week following Bouteflika’s resignation, marking the largest mass movement in the country since the 1988 popular uprising. 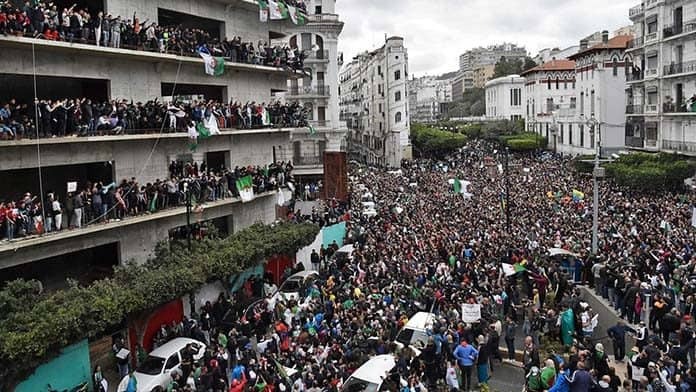 Echoing the demands of the 2011 Arab Spring, hundreds of thousands marched in the capital Algiers and other cities across the country chanting “the people demand the downfall of the regime”—not just its figurehead. Teachers have shut down schools with a national teacher’s strike taking place in mid-March to coincide with the meeting of Algeria’s constitutional committee, which determines who is eligible to run in the election. Industrial action has spread to other industries such as transport, energy and goods and services as well as textile workers who have been taking part in an indefinite strike since 27 February. Socialist activists in Algeria have posted photos of workers occupying factories, bus garages and mobilising on the streets, raising demands for better pay and conditions as well as the right to organise trade unions. For some young protestors, Bouteflika’s resignation marks the first time in their lifetime they can imagine a new future. Since gaining independence from the French in 1962, Algeria has seen little change in political leadership. Bouteflika has been mute and paralysed since a stroke in 2013 and since then he has not given a speech, interview or spoken a single word in public. In fact, as a political leader, Bouteflika has never given an interview to the media in his 20 years in office. Protestors have now turned their attention to dismantling the system of power of high-ranking officials, the military and the ruling class behind the incapacitated president. The ruling class moved to dump Bouteflika in order to maintain as much of the regime behind him as possible. Both the head of the military Ahmed Gaid Salah and the former prime minister Ahmed Ouyahia, who also since announced his resignation, called publicly for the president to resign. However, the protests are demanding, “the army to hand power to the people”. Under the slogan “No to the 3Bs”, they are calling from the resignation of prime minister Moreddine Bedoui, president of the constitutional council Tayeb Belaiz and president of the senate Abdelkader Bensalah. The former foreign minister, Bouteflika came to power following the military defeat of an Islamist insurgency in the 1990s. In the early years of his presidency, oil money flowed freely in Algeria, and along with it a generous social benefits scheme and a loans fund for young people. But the success of the regime was predicated on a network of corruption as the ruling class grew their wealth off the backs of public money as well as an economy dependent on oil which makes up 97 per cent of exports. The 2014 fall in oil prices hit Algeria hard, resulting in a dismantling of the welfare systems as well as cuts to subsidies for essential goods and services. Youth unemployment rose to 30 per cent in a country where one third of the country is aged under 30. The strikes and protests have already spread to neighbouring Morocco where teachers are rallying to end the dictatorship, to Tunisia, the only country to become a democracy following the Arab Spring, where workers are on strike over wage demands, and Sudan, where thousands of people are calling for a revolution over the costs of living and calling for the President Omar Hassan al-Bashir to resign. State news media in Algeria were originally banned from covering the growing protests, but have now begun reporting on them, under the headline “the street is not backing down”. But for the protests to have any lasting impact they must move beyond demanding democratic elections to more fundamental questions about how society is run. Otherwise the systems of power and privilege in Algeria will remain, even if the dictators do not. Algeria’s own history shows us this—the liberation of Algeria from French colonialism did little to liberate the working class and poor. Extending the workers’ strike movement into a challenge to the power of the rich holds the key to fundamental change in Algeria.